Three Velcro straps secure bag to seat post and rails. 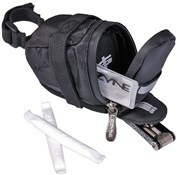 Neoprene compartments organize tyre repair, multi-tool and money/ID. Water resistant zippers and reflective tail light loop make caddys ready for all weather.